Hasenpflug was clearly a versatile advertising photographer. He specialised in fashion and product advertising and some portraiture2 and, despite his apparent lack of photographic training until the 1930s, in Australia he seems to be have been more clearly influenced by European new photography than most of his Australian peers. Many of his photographs, regardless of genre or subject matter, depend on diagonals through the picture plane and raking light. ‘Glasses’ is no exception. The rimless spectacles sit neatly on a brochure advertising their features. 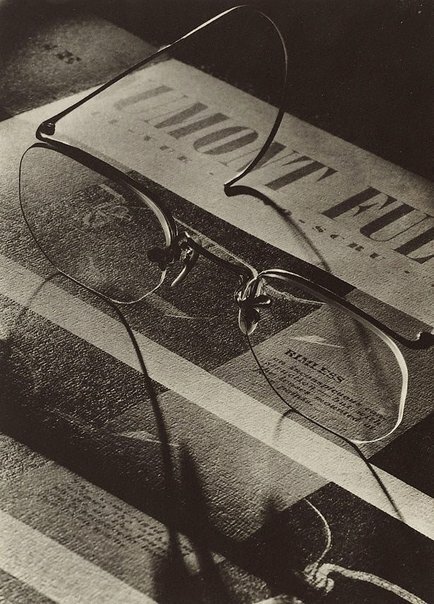 The diagonal placement of the glasses is emphasised by the bands of light in the brochure design and one lens sits over the ‘rimless’ descriptive text. The curve of the spectacle frame leads the eye up to the top centre of the image and then back down again. The composition is elegant and, in comparison to Olive Cotton’s ‘Glasses’ c1937 (AGNSW collection), is not dramatic. Hasenpflug had to please a client whereas Cotton was probably pleasing herself. Signed u.l. verso, pencil "Hasenpflug". Not dated. Judy Annear, Photography: Art Gallery of New South Wales Collection , 'Australian modernism', pg.131-149, Sydney, 2007, 145 (illus. ).